(CNN) -- On a recent Southwest Airlines flight, a man dropped his pants and exposed himself to the female passenger sitting next to him, then punched her, according to an FBI affidavit. The plane was in midair, and the naked man reportedly grew angrier, screaming uncontrollably and shaking his fist in the air. In August, a man on Southwest Airlines exposed himself and punched a fellow passenger, an FBI affidavit says. The man had gone "berserk," said James Scanlon, a 52-year-old passenger who witnessed the August incident. "He was jeopardizing my safety on that airplane. I was afraid he would rush the cockpit or try to jump out." Laws prohibiting interference with flight crews and attendants on aircraft have been on the books for decades. But since the September 11, 2001, attacks, federal officials and airlines have clamped down on misconduct, imposing bigger fines and stricter punishments for passengers who behave badly. "Now people are more hyper-vigilant on what occurs on aircrafts," said Ron Koziol, assistant section chief for the FBI's violent crimes unit, who calls airplanes a "high-risk" environment. "The U.S. government is more aware of what can occur on an aircraft, and [officials] don't want those issues causing the plane to be in an unsafe environment." The FBI reports an average of 80 incidents aboard aircraft each year. The man on the Southwest fight, Darius Chappill, was charged in U.S. District Court in Oakland, California with interference with a flight crew and accused of exposing himself. If convicted, he faces up to 20 years in federal prison and a $250,000 fine. The Federal Aviation Administration, which handles unruly incidents deemed to be civil violations, has reported more than 900 cases over the past five years. In 2000, a series of incidents in which passengers verbally harassed and hit crew members prompted the FAA to boost the civil penalty fine for interfering with a crew member from a maximum of $1,100 to $25,000. The FBI usually handles more serious cases of abuse or dangerous behavior. The FAA numbers don't reflect all the cases of inappropriate behavior, said Les Dorr, a spokesman for the agency. Crew members are used to experiencing the wrath of passengers who are frustrated by delays and missing baggage. Sometimes, these incidents aren't severe enough to be reported to government officials. Many confrontations occur when a flight attendant refuses to serve an intoxicated passenger another alcoholic beverage, according to flight attendants. When the temper tantrums get physical, airline officials may resort to plastic handcuffs and restraining tape. On a Frontier Airlines flight in July 2007, passenger Tamera Freeman was seen physically abusing her children, who were crying, according to court documents. The court records show that when the flight attendant refused to serve her alcohol, Freeman threw her drink at the attendant. Crew members subsequently taped Freeman into her seat, and she spent three months in jail for the incident. Passengers who fail to comply with standard airline policies -- such as staying seated when the seat-belt sign is on or turning off electronics when the plane is landing -- also spark confrontation, airline attendants said. Christina Szele, a New York passenger onboard JetBlue Airways in 2008, decided to smoke in her seat last summer despite the no-smoking law implemented on U.S. flights in 1990. Court documents revealed that when flight attendants asked Szele to stop, she began to yell obscenities and racial slurs. The flight was diverted to Denver, Colorado. Szele later was sentenced in U.S. District Court in Denver to serve five years' probation for interference with a JetBlue flight crew member. Szele was ordered to participate in anger management and drug and alcohol abuse treatment as well as fined nearly $8,000. Tim Smith, an American Airlines spokesman, reported a slight decrease in the number of incidents of misconduct this year compared with last year. The number of unruly passenger incidents tracked by the FAA also has dipped since 2004. The punishment for unruly behavior can be severe. In addition to federal charges, fines and jail time, passengers who are prosecuted may be liable for paying to divert a flight to an unscheduled airport, which can run into the tens of thousands of dollars. Depending on the offense, the unruly passenger may be banned from the airline permanently. But some passengers said they believe the airlines and government are reacting too harshly. "You can't have a dispute on board an airline with the flight crew period," said Charles Slepian, CEO of Foreseeable Risk Analysis Center Inc., a security consulting group. "In some instances, it's a good thing. But others will say it is a violation of my First Amendment rights." Several airlines require their attendants to take courses on how to defuse confrontations and calm passengers who make belligerent threats. "We have all accepted that when we chose this career path our job is to be a safety professional," said Kelly Skyles, national safety and security coordinator for the Association of Professional Flight Attendants, an organization that represents attendants at American Airlines. "I'm the eyes, ears and nose of the aircraft to report everything to the cockpit. The service part, that's just a bonus of our job." Diana Fairechild, an aviation consultant and flight attendant for two decades, said flying conditions have become more strenuous. Few airlines serve meals on domestic flights, and snacks and drinks are carefully rationed. 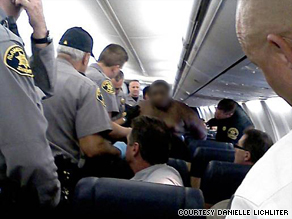 The seating space is smaller, leaving passengers feeling crunched. There are more delays, fees and less fresh oxygen on board, she said, which can trigger angry behavior. Fairechild said she has seen the quality of customer service dwindle since September 11 as some crew members have shorter tempers in dealing with passengers who disobey the law. "Listening helps," Fairechild said on the skills she used to deal with rowdy passengers. "Patience. Just being heard makes a big difference." All About Federal Aviation Administration • Air Travel • Southwest Airlines Inc.